Height 5 feet 3 inches. Weight 120 lbs. Chest measurement 30½-33 inches. Complexion fair. Eyes grey. Hair auburn. Sight, hearing and colour vision all normal. Heart and lungs normal. Teeth satisfactory, upper artificial. Illness - tonsilitis 6 years ago. No fits. Free from inveterate or contagious skin disease. Vaccinated. Good bodily and mental health. No slight defects. Throat healthy. Fit. Struck off Strength of N.Z.E. Force. Margaret Hepple Thompson was born on 17 December 1886 at Pleasant Point, the second daughter of James and Annie Elizabeth (née Robson) Thompson. Margaret started school at Pleasant Point School, where her father was the headmaster for many years. James Thompson, from Northern Ireland, died in 1913 in Christchurch. Having taken up nursing, Margaret was successful in passing the State Examination for registration of nurses in mid 1915 at Christchurch. Never would it have occurred to her that her career would be so short-lived. Nurse Hepple Thompson was one of those who supervised the tennis and croquet and other games, when in January 1916 the nurses gave a large garden party in the grounds of the Christchurch Public Hospital, in support of the Soldiers’ Queen. At the time of her enlistment (31 January 1918), she was the Sister in Charge of the Soldiers Ward at Christchurch Hospital. She had had tonsillitis six years earlier but her throat was now healthy. A week later she had reported in camp and was taken on the strength of the N.Z. M.C., Featherston. She named as her next-of-kin her English born mother of 119 Hawthorne Road, Cashmere, Christchurch. R. N. Margaret Hepple Thompson embarked on 10 April 1918 on the Corinthic, proceeding to England with a special contingent of nurses and masseuses. Friends wishing to write to these members of the New Zealand Army Nursing Service were advised to address them with their numbers at Headquarters, N.Z.E.F., 8 Southampton Row, London. The Red Cross Society, Wellington, kindly sent a small parcel of sweets for each of them, and Her Excellency, Dame the Countess of Liverpool kindly sent each member a novel to read on the voyage. After a week’s leave on arrival, Margaret was posted firstly to the New Zealand General Hospital at Walton before being transferred to Torquay. She returned to New Zealand on the Remuera, one of four Canterbury nurses in Draft No. 299 of over 600 men and women, which was due to reach Auckland on 22 October 1919. The following month she was struck off Strength and posted to the Temporary Reserve List. Still with the N.Z. Army Nursing Service, she was promoted to the rank of sister, effective from 1 April 1920. Staff Nurse Margaret Hepple Thompson, 22/486, died at the age of 35 on 28 February 1921 at her mother’s home, at 119 Hawthorne Road, Cashmere, Christchurch, her funeral leaving from there for the Sydenham Cemetery. It was initially thought that Margaret had died of influenza, but she had died of acute pulmonary phthisis (TB). Her death was attributed to her war service, as recorded on her personnel file. She had taken ill (pleurisy) in August 1920 while on duty at Montecillo Convalescent Home, Dunedin, and in October returned to her home at Cashmere Hills, Christchurch to convalesce, as, being a bad sailor, she dreaded the sea trip necessary to go to the Nurses’ Convalescent Home at Petone. By mid November she was extremely ill, with high fever, night sweats and rapid wasting. Her doctor reported that he had visited her at home on 21 February 1921, that there was no improvement in her condition, that she was getting thinner and weaker and quite unfit for transport [to Civil Sanatorium]. 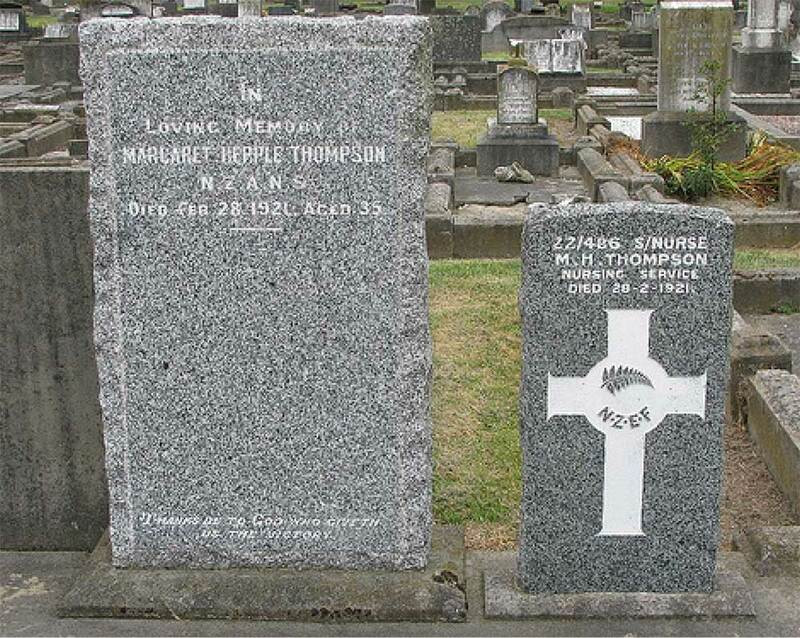 Margaret was buried in the Services section of Sydenham Cemetery where she has two headstones – one reading “In loving memory of Margaret Hepple Thompson N.Z.A.N.S”, probably the first to be erected, the other a Services stone bearing her service number 22/486 and rank S/Nurse. New Zealand’s first hospital chapel was erected at Christchurch Hospital in 1928 as a memorial to those Nursing Sisters of Christchurch who made the supreme sacrifice when the “Marquette” was torpedoed. Other tablets were to be erected later, including one to Nurse Margaret Hepple Thompson who died as a result of war service. She is indeed remembered on the New Zealand Military Nursing World War One Roll of Honour (Christchurch Hospital Chapel). Margaret left a will dated 1908, in which she named her mother as sole executor and beneficiary of her property. If her mother had predeceased her, the property was to be divided among her surviving sisters and the eldest of them to be the executor. As of 18 May 1921, balance of pay due to her estate from the Defence Department was £64.13.4., including an allowance in lieu of Hospital Maintenance and a Uniform Upkeep Allowance. Margaret was awarded the British War Medal, and in 1925 she was deemed eligible for the plaque and scroll. She was a sister of Aubrey Edward Thompson who was died at sea en route to England in 1917. A younger brother, Eric Dudley Thompson born in 1893 at Rakaia also served in World War One.